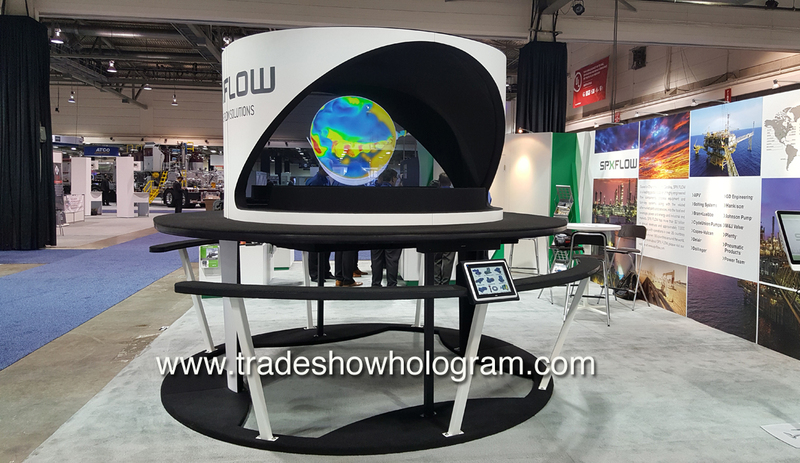 Large 3D Hologram Projector featured at Trade Show. The display is a dual sided exhibit which allows viewers to select and view holographic presentations. The presentations are on demand via the touch screen. Views can view presentations on one side while viewers on the opposing side can view entirely different presentations. Both presentations play with out them interfering with each other. The display features the new Ultra Bright Projection System. This allows the images to remain bright and clear even in bright trade show environments. The 3D effect can be seen from far across the trade show floor.